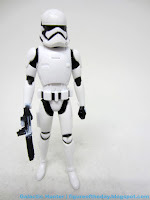 Commentary: Even Droids never got their own animated Stormtrooper! This First Order-flavored cartoon trooper is the kind of thing I would have swooned over in the late 1980s - a future figure that carries on the story, in a cartoony style! 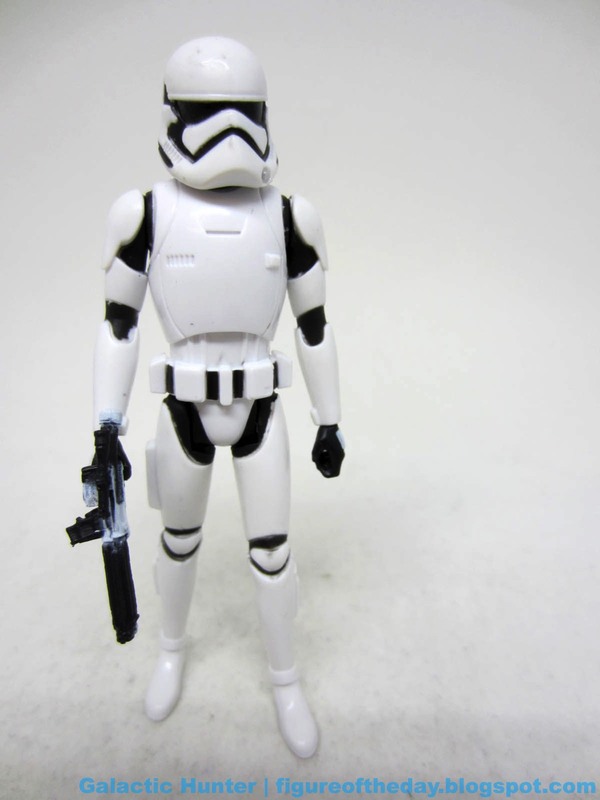 With 5 joints and an exaggerated scowl, it's a Stormtrooper! What else could you want? 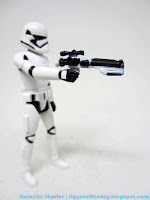 The figure lacks the hip plug for the blaster, but there's a lot of paint on the weapon. Molded in white, there are lots of black markings on it to bring it to life. 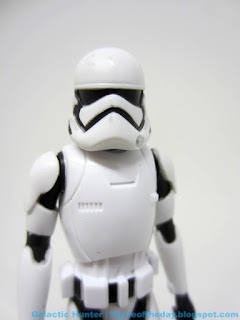 Similarly, the helmet has black and silver markings, more or less matching the look of the animated show. 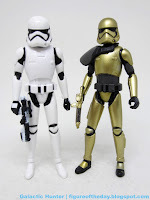 It's very clean, and a good take on the sequel series troops. We don't get painted soles on the boots, but that seems to be increasingly rare. The figure isn't nearly as ornate as the others in this line, which I assume was on purpose - they have to cut costs somewhere. 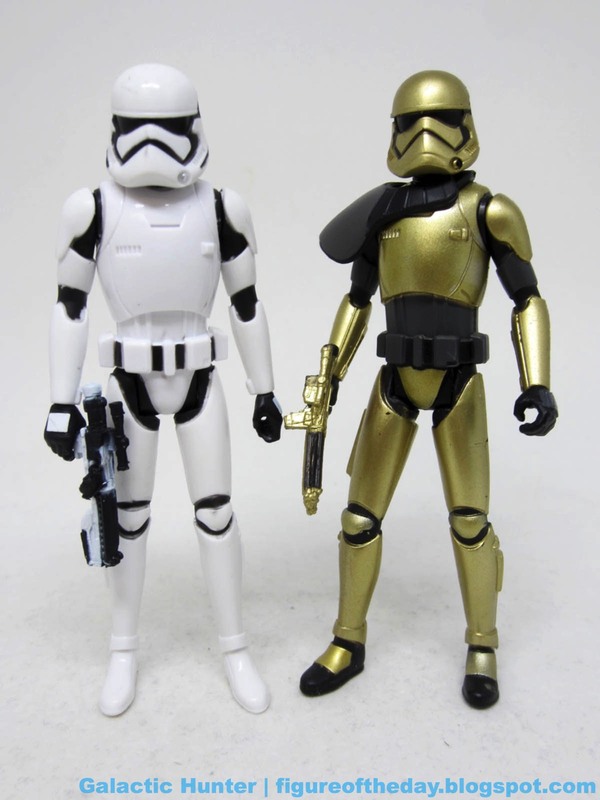 At first glance I thought the Stormtrooper was the same mold as Commander Pyre, but this isn't the case - the gold trooper's pose and chest are slightly different at a quick glance. Range of motion is very good but falls short of my 5POA ideal - the legs can't get that perfect 90-degree angle, but they come close. The arms and wrists swivel as you please, and the ball-jointed helmet is as perfect as these heads can be. I like it, and I kind of wish we'd see more like this. If Hasbro ever feels like retooling the hips, I'd buy a few more to fit in my old Mini-Rigs. It's a fun figure. Because this line is small, I can't not recommend it. BB-8 and Poe are the only other movie characters to get the cartoon treatment, so go ahead and snag this one if you like the look. Its center of balance may require you to swing the arm forward a bit, but other than that? It's nice.